Although she worked regularly in film and television from the late 1990s, Melissa McCarthy truly burst onto the scene with her Oscar-nominated part in 2011’s “Bridesmaids“. Since then, she’s been all over the place with her successful CBS sitcom Mike and Molly and movies like “This Is 40“, “The Hangover Part III“, and another 2013 entry, “Identity Thief”. Is it worth it to seek it out? 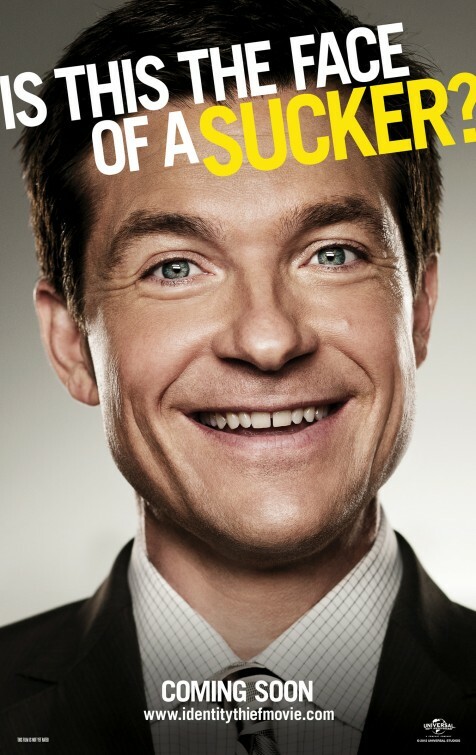 With a decent job, a nice house, two daughters and a third on the way with wife, Trish (Amanda Peet), Sandy Patterson (Jason Bateman) has a pretty decent life, if a dollar-conscious life. He’s even started a new job that will pay him more money, giving his family far more financial security….or so he hopes. Sandy starts getting calls from an odd assortment of places confirming appointments and reservations, and then he finds out what’s going on. His identity has been stolen, and someone is racking up huge amounts of debts on his accounts. 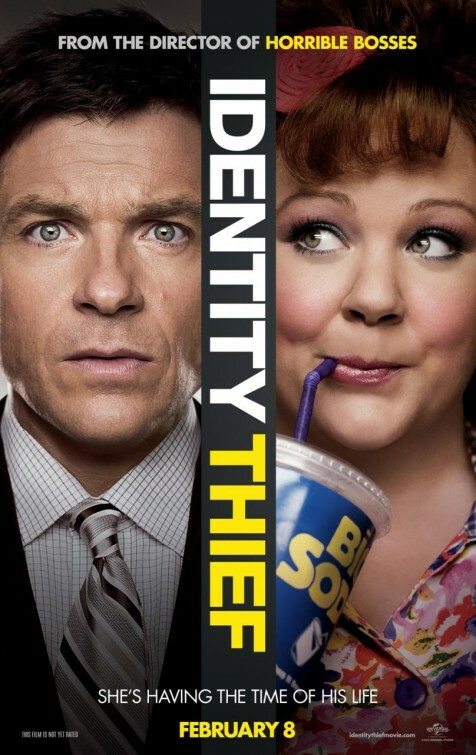 The police are basically handcuffed by the law and jurisdiction, but they can tell Sandy that his thief is a woman, Diana (Melissa McCarthy), living it up in Florida on his credit. The only catch? The cops can’t do a thing, leaving Sandy to bring her back to face the charges. Oh, this should go smoothly. I think this comedy from director Seth Gordon (“King of Kong: A Fistful of Quarters”) is undone by one fatal flaw. If this sounds preachy or condescending, so be it. In the age of Internet thievery and identity theft, the premise here is obviously incredibly timely. Why then does Gordon, scriptwriter Craig Mazin and the film insist on trying to make McCarthy’s Diana sympathetic? Again, if that sounds naive or innocent, get over it. She robs people – more on that issue later – and then creates her own identity with their name, credit card info and social security number. Maybe it’s not even that she does it, but that in the third act ‘Thief’ tries to rationalize why she does it. Oh, no, she was abandoned as a child! Oh, goodness, I’m sorry you robbed me of all my money! We’re good, don’t worry about all that identity theft. Just commit, make McCarthy a bad guy. Don’t try to rationalize it all. On to bigger and better things….other flaws that do a solid job of knee-capping this movie, considering its early goings had some potential. The script is atrocious. So many scenes happen and/or develop simply because the movie needs to continue, not because it makes any sense at all for those things to happen. Example No. 1: In the opening scene, Bateman’s Sandy picks up the phone and gives McCarthy’s Diana his social security number because she says his identity has been tampered with and “her company” can offer security. He gives it to her. Are you kidding me? This guy is a high-level, very intelligent accountant, and he just throws his number out there because the voice at the other end asks for it? Awful. Oh, and my random favorite is when the story requires Sandy and Diana to be stranded in the middle of nowhere. Sandy’s rental car is across a lane of traffic on an expressway (just go with it, it’s a long story how it got there). An 18-wheeler semi crashes into it at full speed, incinerating it on impact. In what world does that happen? The truck wouldn’t stop, turn, avoid it? Then, upon hitting the car, it wouldn’t stop? Amidst all this garbage is the potential for at least a mildly entertaining movie because of the pairing of Bateman and McCarthy, an Odd Couple match made in hell. They do have a great chemistry together, the lunacy of what Bateman’s Sandy actually has to do providing some really funny moments through the first 45 minutes. Though the script does her no favors, McCarthy is an extremely talented actress and comedian. She commits to her parts physically, taking abuses you wouldn’t normally expect of a female comedian. Once Sandy dupes her into going back to Denver to settle things, Diana basically decides to make the trip a living hell. Some scenes go too far, just pushing further than they need. If the flick would have figured out a better, more pointed tone, then we’d be onto something, but instead the two talented actors are left swinging in the breeze. Bateman’s deadpan delivery paired with McCarthy’s over the top antics work surprisingly well. The rest of the cast doesn’t come away so well. Peet is good in a thankless part as Sandy’s worrying, well-meaning wife. Jon Favreau is ridiculously bad as Cornish, Sandy’s ignorant, very rich boss who has no concept of what human interactions are really like. Genesis Rodriguez (“The Last Stand“) and rapper T.I. are unnecessary as two henchmen of a jailed drug cartel leader (Jonathan Banks) who Diana pisses off (because there wasn’t enough going on in the story already) and are trailing her. Similarly unnecessary is Robert Patrick as a debt collector with $ for eyes. Also look for John Cho and Morris Chestnut in supporting parts. While I enjoyed the first 40-45 minutes or so, things derail and do so quickly. The movie clocks in at a ridiculously long 111 minutes. There are multiple points where I thought things were wrapping up, and then it keeps going. One stupid scene after another develops, things getting more ridiculous by the scene. At one point, Sandy actually has a snake fall from a tree onto his neck, Diana trying to remove the snake with a stick on fire. By the time Diana meets Sandy’s family and we hear her sob story, I was done. It’s a wasted opportunity here. Hopefully there isn’t a sequel coming our way either, but I certainly wouldn’t be surprised.